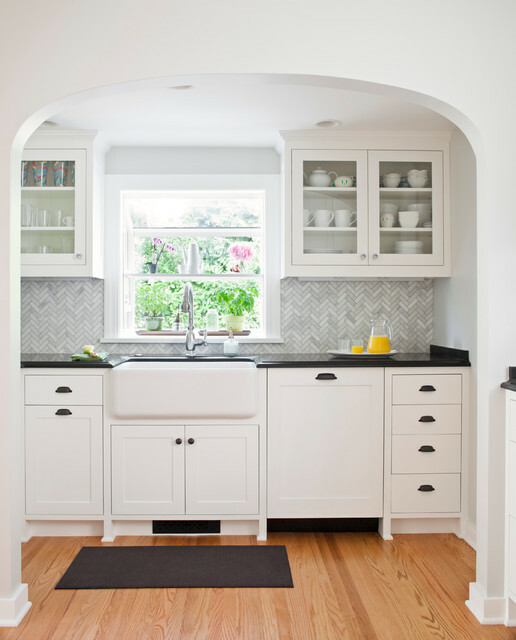 The kitchen floor is Bianco Carrara 12x12 with a border of Nero Marquina Marble, and the inlay is the Biance Carrara 6x6. 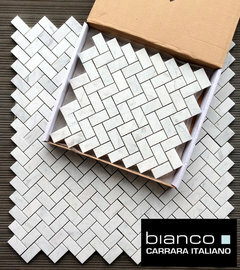 The backplash is also Bianco Carrara Marble in a herringbone pattern. 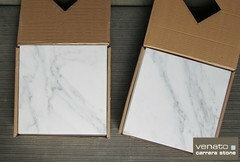 These materials can all be purchased through Ceramic Decor. Hope this helps! 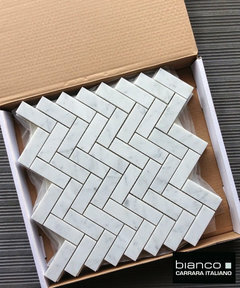 Who is the maker of the carrera tile? 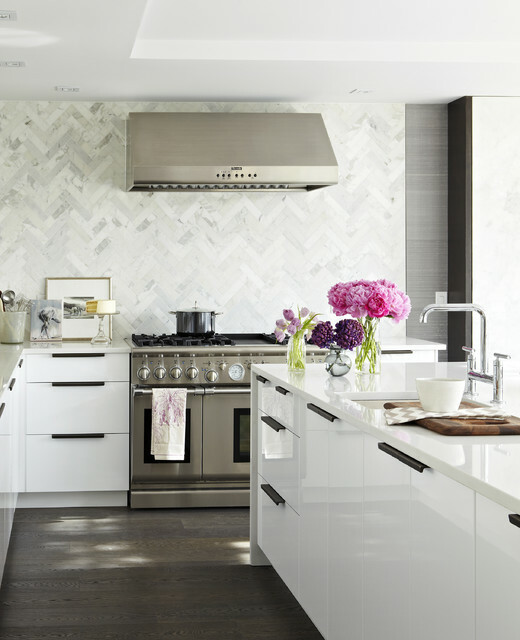 The backsplash tile is a Carrara Bianco Herringbone. I cannot tell from the image if it is a classic 1x2" format or if they have gone with the 1x3". It really looks like the 1x3" so I have attached pictures of ours, which is pretty much identical. 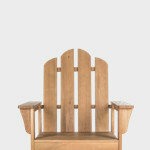 I have shown our prices from our website to give you an idea of cost as well. 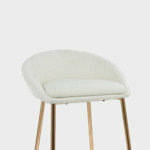 Available in both honed and polished. 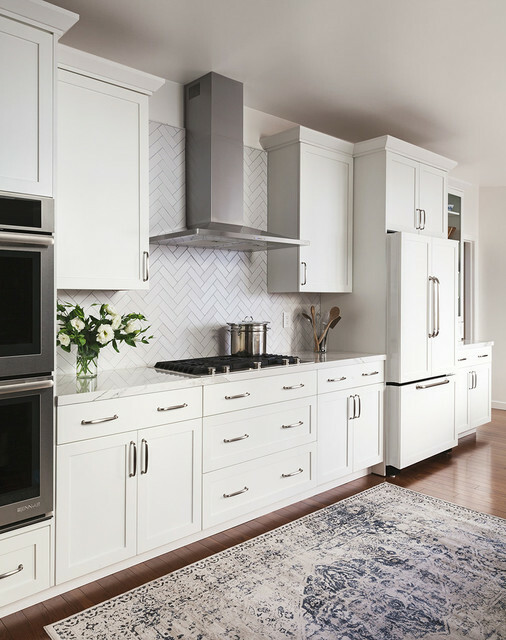 - You state in one of you responses that you don't recommend marble for this application...what would you recommend instead o still achieve a similar look with these lower cabinets and backsplash? 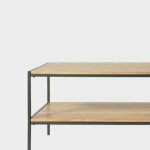 I'm also doing in island in grey with a walnut butcher block top. Thanks! 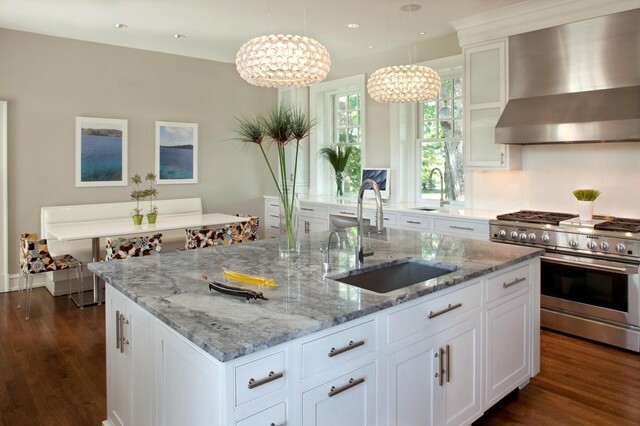 Cambria offers a great alternative to marble with it's Torquay palette. 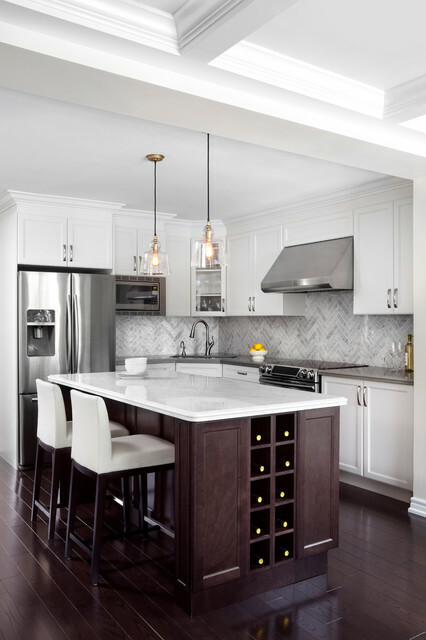 Some of the advantages of going with Cambria quartz over marble include it's strength/durability, stain resistance, and lifetime warranty. 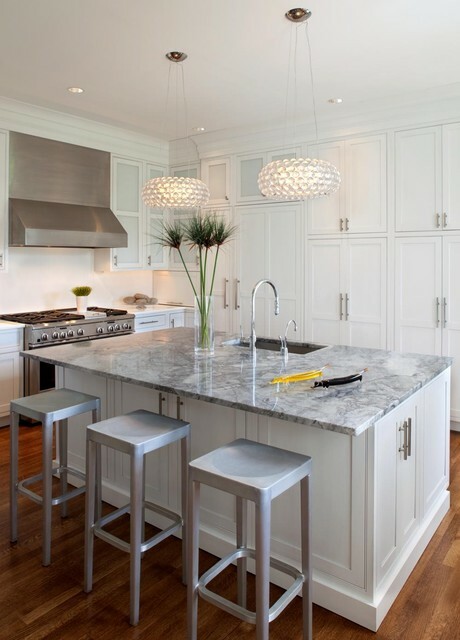 We do not recommend marble for areas where it will be exposed to acidic materials as it will etch. It is also prone to chipping, so high traffic/constant use areas are also not advisable. In our opinion. 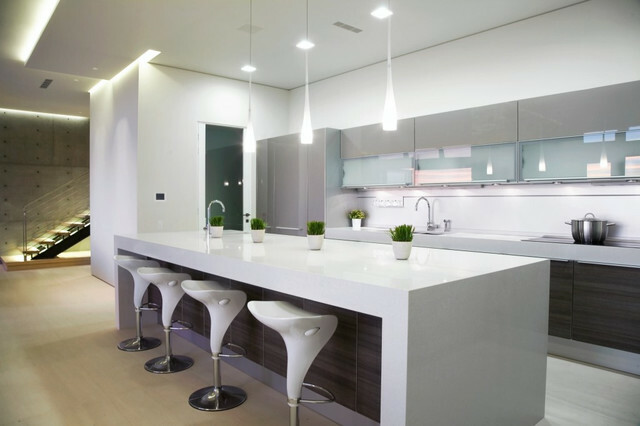 - what is the grout color? beautiful! 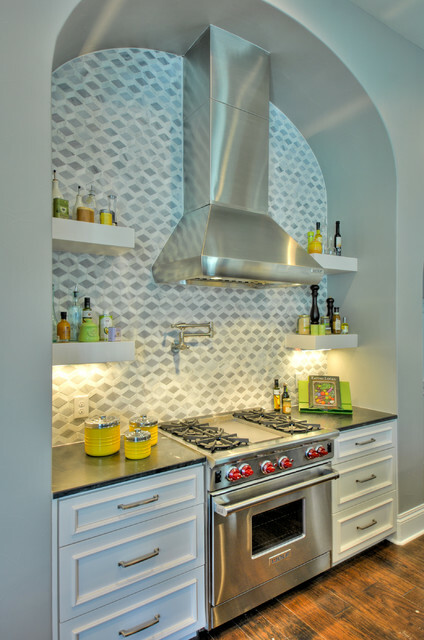 may i ask where you bought your backsplash tiles from? - If the appliance to the right of the sink is a dishwasher, what is to the left of the sink? I like the symmetry. Thanks! 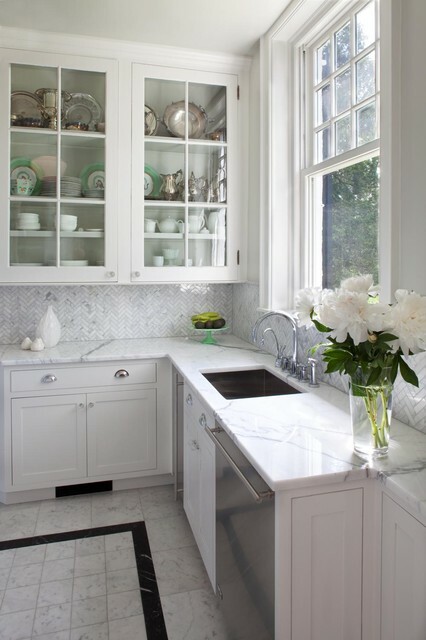 I'm taking a guess on this one but I think that is a GE Monogram ice maker to the left of the sink. 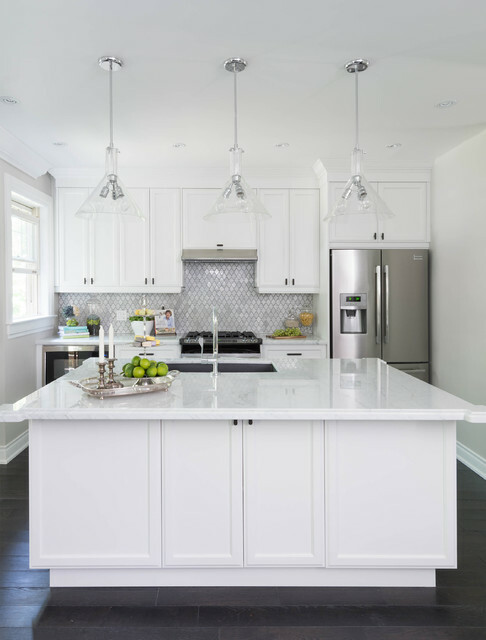 Unfortunately it wouldn't be entirely symmetrical because a standard dishwasher is 24" wide and an ice maker is 15 or 18" wide depending on the model. 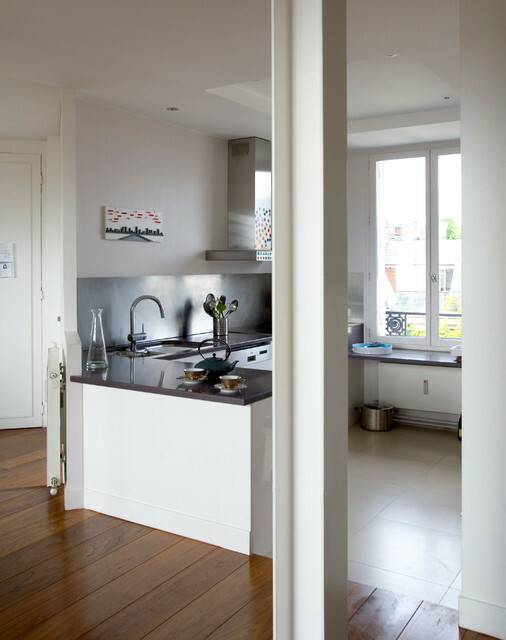 A 24" undercounter stainless front fridge would give equal weight to the stainless on either side. Sargent Appliance is correct, that is a GE monogram ice maker. 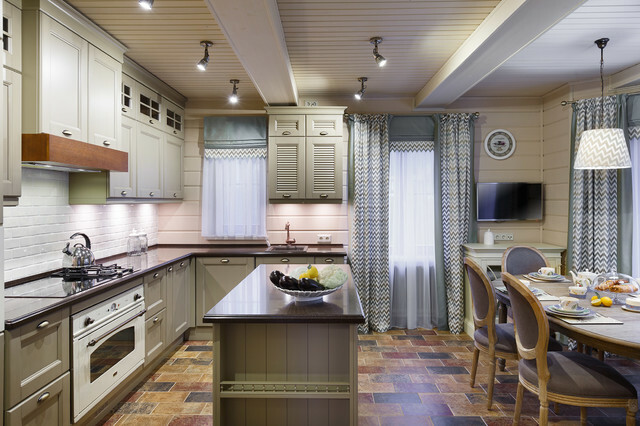 This is a butler's pantry so those are the only appliances in this room. 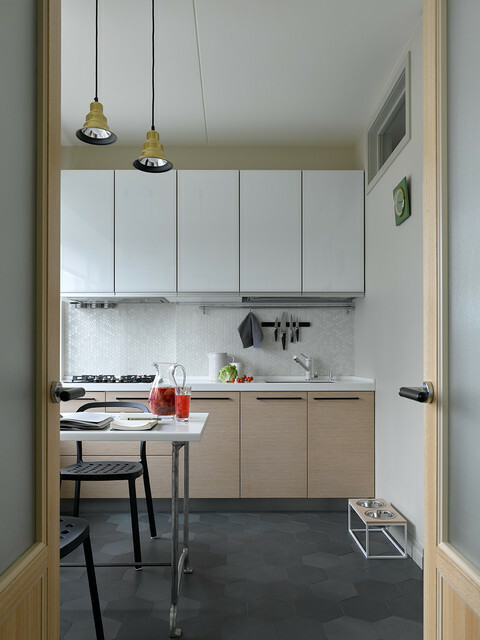 What is the color used for the wall (paint)? 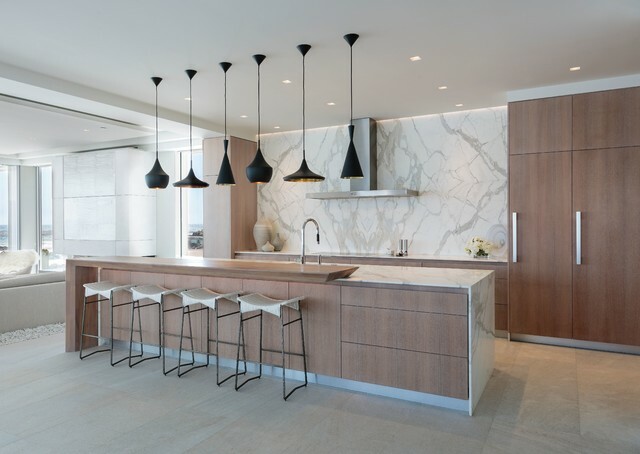 I would also like to know the color of the walls and cabinets, Thanks! 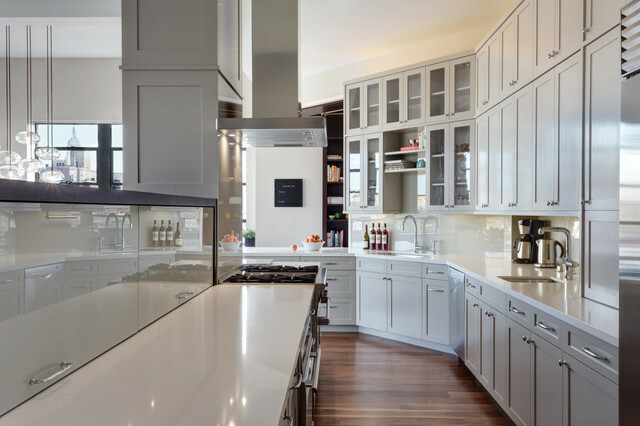 What is the color of the cabinets? 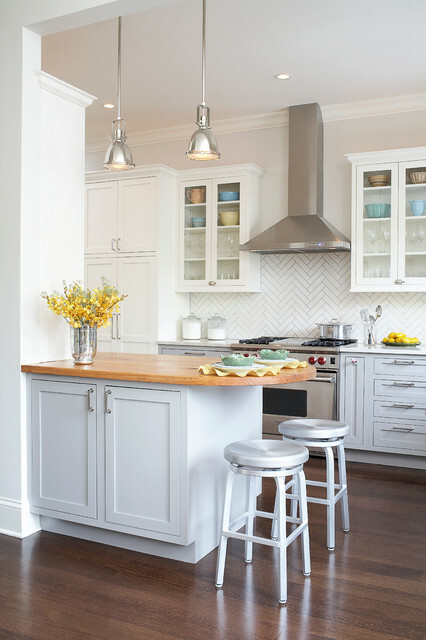 what size tile is used for your herringbone backsplash? It's perfect. 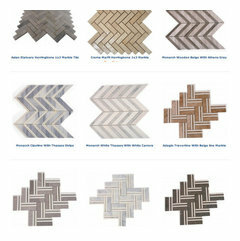 To get a bigger size Herringbone I suggest the 1x3" Herringbone, the longer 1x3" format just makes it look less blocky and creates a well, almost perfect Herringbone backsplash. 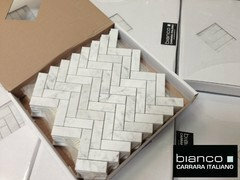 Also is included is a picture of our Bianco Carrara 1x2" Herringbone. 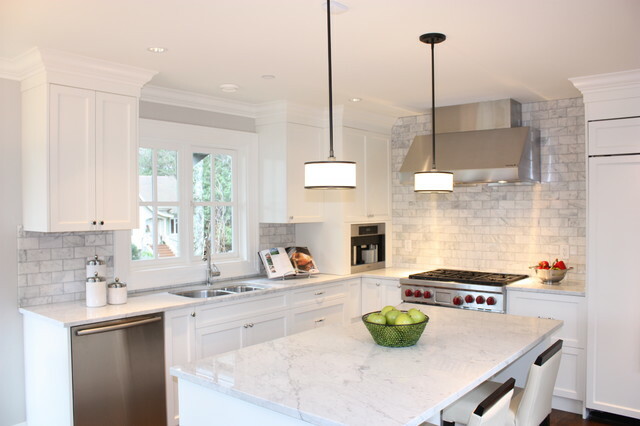 The project binder indicates this was "Designer White" the cabinet company's pure white paint. 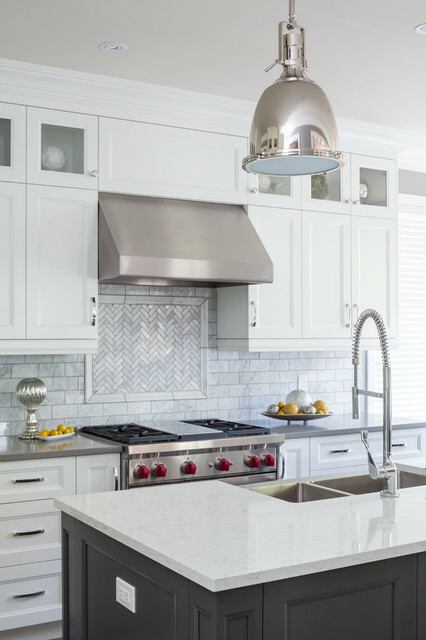 What size is backsplash ? 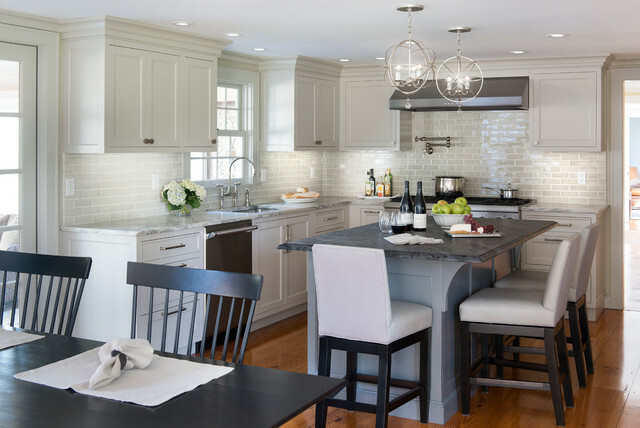 - What size is the backsplash? I believe it is a 1"x3" herringbone pattern. - This is gorgeous! Can you please tell me what color grout that was used. Yes, would love to know the grout color as well. 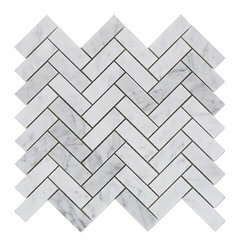 Any rectangular tile can be laid in the herringbone style. 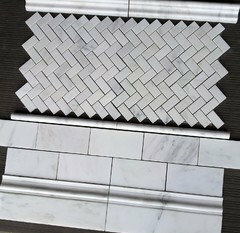 To get the best results/look, make sure the tile width is 1/4th of the tile length e.g 3"x12" or 6"x24" or 12"x48". - Is this granite? If so what is the name? 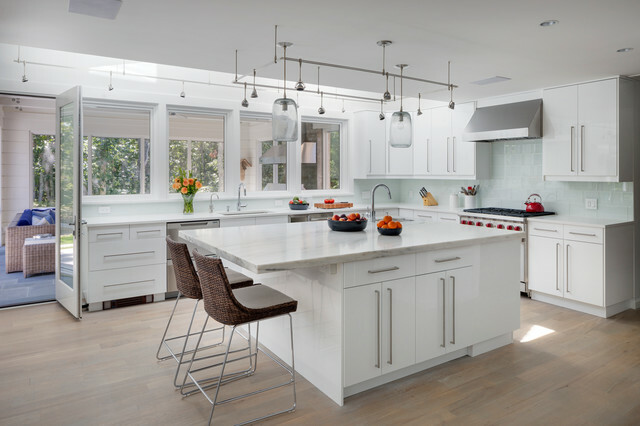 Beautiful space! Can you please share the source/info. 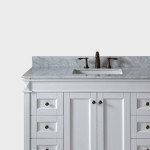 about the sink? Thanks!